Stevia sweetener contains zero calories, and is very healthy, and unlike refined sugar, is rich in essential nutrients and antioxidants. It is recommended to all, especially diabetics and obese people who wish to return their body to normal. There are very popular cakes for diabetics, which consist of stevia. Research has shown that natural sweeteners do not affect blood sugar and insulin action, which allows such people to enjoy a variety of delicacies. Stevia rebaudiana is a plant native to South America and belongs to the family of Asteraceae, which includes sunflowers and chrysanthemums. Traditionally stevia plant was used as a natural sweetener for beverages and to make tea. Read on to learn the benefits of this plant and how to use it in your daily diet. Stay tuned. How do you get steviol-glycosides? "Stevia" is the name of the whole plant, although only some parts are sweet. Today the name is used for steviol-glycosides, the sweet components is obtained from the leaves of these plants, which are 250 to 300 times sweeter than artificial sugar, so it is added to food and drinks in much smaller amounts. The plant does not darken or is caramelized in the same manner as sugar. It contains zero calories, but that does not mean that you will necessarily lose weight if you replace sugar with stevia sweetener. The leaves of stevia contain potassium, zinc, magnesium and vitamin B3, as well as a significant percentage of fibre, which help to prevent prisons and improve digestion. It also contains a lot of iron, but can be helpful with anaemic individuals. Steviol glycosides are extracted from the leaves of stevia, and then filtered and purified. This procedure is similar to the obtained sugar and vanilla extract. After extraction and purification, steviol- glycosides are composed same as those contained in stevia leaves. This process gives a cleaner taste, similar to sugar, and the purification is very vital for health safety. Glycosides stevioside and rebaudioside A are important because of their sweet properties. With them rebaudioside C, dulcoside A rubusozid, steviolbiozid and rebaudioside B, are related which in small quantities are contained in steviol glycosides. Rebaudioside A is approximately 250 to 300 times sweeter than sucrose. All steviol-glycosides have a common steviol basis, and the difference is in the number and arrangement of sugar molecules pinned to it. The final product is a purified sweetener stevia-glycoside, flavour that is used in the diet. How to use stevia sweetener? More than 5,000 foods and beverages around the world now contain stevia. Most are chocolates, ice creams, various desserts, sweets, canned foods, sauces, fruit yogurt, chewing gum, diet drinks, just because stevia sweetener is extremely appreciated. Extracts of the leaves of stevia in the US are used as a dietary supplements since the mid-twentieth century, and many contain a mixture of sweet and non-sweet ingredients of the leaves. Some recipes allow the use of these natural sugar substitutes, however, the dose used varies, depending on the product itself, but should adhere to the manufacturer's recommendations when the stevia sweetener comes in question. Stevia plant is not calorific, namely natural sweeteners which are obtained from it have minimal or no calories per dose, depending on the other ingredients which are combined with it. This is important for people who take care of their weight or have diabetes. Stevia sweetener contains some vitamins (A, B, C), minerals (iron, zinc, and calcium), electrolytes (salt, potassium), proteins and other elements. 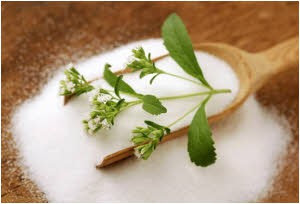 Research has shown that sweeteners from stevia do not add calories or carbohydrates to diet and do not affect the levels of blood sugar and insulin, which allows people with diabetes to eat a variety of delicacies. In a randomized controlled 6 –week testing, 122 people a day were taking four doses of 330 mg of steviol equivalents. Compared with placebo, stevia plant did not affect blood sugar levels. In addition, the scientific work of Academy of Nutrition and Dietetics (on the topic of nutritive and non-nutritive sweeteners) analysed randomized controlled trials and effects of steviol on metabolic processes in comparison with the placebo effect. Studies have shown that there was almost no change when it comes to blood sugar, insulin levels, hypertension and weight. In one study in which they registered minimal changes, people with type 2 diabetes reported a postprandial blood glucose and glucagon response after a meal with stevia, compared with a meal containing a placebo. The causes of the obesity epidemic in the world are very complex and include factors such as reduced physical activity, long sitting at the computer, as well as excesses in high calorie foods rich in fat and added sugars. It is estimated that refined sugar accounts for 16 percent of total calories in the modern diet, which is considered one of the leading culprits for a drastic increase in the number of obese people and diabetics. Since the stevia plant contains no calories, it is an ideal replacement for sugar. Replacement of only 25 grams (about six teaspoon) of sugar with stevia means 100 calories less. The plant stevia contains many compounds sterols and antioxidants - triterpenoids, flavonoids and tannins. The most important flavonoids and polyphenols, antioxidant phytochemicals that are found in stevia, are: kaempferol, quercetin, chlorogenic and caffeic acid, isoquercetin and isosteviol. According to the American Journal of Epidemiology, the study showed that kaempferol can reduce the risk of pancreatic cancer by 23 percent, which is a very important information for men. Other antioxidants also play an important role in preventing cancer. In addition, stevia sweetener neutralizes the harmful effects of free radicals and prevent cell damage. Stevia extract showed strong antimicrobial activity against a wide range of pathogenic bacteria, including some layers of E. coli and salmonella. Also, stevia plant helps to combat Candida, and it turned out that it possesses antiviral activity, in particular in the case of rotavirus. Studies on rats have shown promising immunomodulatory, antimutagenic and antioxidant effects of stevia. Certain glycosides of stevia extract dilate blood vessels and increase the excretion of salt and urine. In a little higher doses, stevia plant can lower blood pressure. This plant can have a cardiotonic effect, i.e. normalize the pressure and regulate heart rhythm. Does it cause any side effects and allergic reactions? In acute toxicity studies conducted on various laboratory animals - it was found that stevioside, the main stevia glycoside, is non-toxic. Independent experts from the US and other parts of the world have concluded that stevia sweetener is safe for all ages, because they are not recorded any major contraindications or side effects. In 2008, the US Food and Drug Administration said that stevia plant is safe as a food and drink. Since there is a lot of consumer interest in low-calorie, natural sweeteners, many companies are using it in their products. In 2010, the European Food Safety Authority has analysed the literature to determine whether there is cause for concern when it comes to allergies to stevia. Analysts have concluded that steviol glycosides are not responding and are not metabolized in the reactive compounds, making it unlikely that they can cause an allergic reaction when they are ingested. In addition, although there is no scientific evidence that genetically modified foods cause allergies, however, be noted that stevia sweetener is not a GMO, so there is no need to fear that it will cause allergic reactions. Stevia sweetener is today on almost all shelves of health food stores, but please note the following: read what is written on the packaging, because believe it or not it can happen that it contains dextrose (sugar). Bypass these products whenever you can and always be informed about the composition of each food you plan to buy. Price of stevia can vary from 6 to 10 dollars for a pack of 20 grams, so everything that is considerably cheaper is most likely the mentioned "mix". Stevia sweetener is much more than a replacement for sugar, you will surely see it for yourself, just as you start using it.